The Tampa Bay Buccaneers needed a win or tie to reach the playoffs as they hosted the Chicago Bears on January 2, 1983. The 1982 NFL season had been interrupted by a 57-day players’ strike that reduced the schedule to nine games. The league thus eliminated the divisions and re-formatted the postseason structure so that the top eight teams in each conference would qualify. The Buccaneers, as had been the case since their inception in 1976, were coached by John McKay, who had twice guided them to the playoffs in the previous three years. They lost their first two games back in September and then the first contest following the resumption of play in November, but had then won four of their last five games to be at 4-4 coming into the season finale. 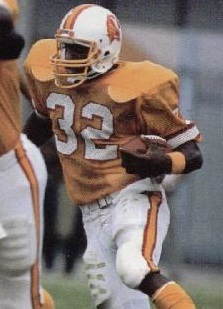 Strong-armed but erratic QB Doug Williams (pictured above) directed the offense and there were good receivers in WR Kevin House and TE Jimmie Giles. Rookie FB James Wilder enhanced both the ground and passing game with his skills as a runner and receiver out of the backfield. The defense had been the key to any success that Tampa Bay achieved and contained noteworthy performers in DE Lee Roy Selmon, NT David Logan, and LB Hugh Green. Chicago was seeking to rebuild under a new head coach, Mike Ditka, and with a rookie quarterback, Jim McMahon. RB Walter Payton provided stability in the backfield, but the offensive line was ordinary. The defense, under the direction of defensive coordinator Buddy Ryan, was aggressive and especially tough against the run. The Bears had a 3-5 record after defeating the Rams the previous week. There were 68,112 fans in attendance at Tampa Stadium on an 80-degree day. The Bears had the game’s first possession and punted, but got the ball back in short order when SS Gary Fencik intercepted a Doug Williams pass at the Tampa Bay 34. Thanks to the running of Walter Payton, Chicago was able to advance to the 18, but Jim McMahon was sacked by DE Dave Stalls for a seven-yard loss on third down and Bob Thomas kicked a 43-yard field goal. The Buccaneers responded with a long drive from their 19 yard line. Due to the passing of Williams, who also had a 14-yard run, they reached the Chicago eight. However, on a third-and-seven play, Williams fumbled while attempting to pass under heavy pressure and DT Steve McMichael recovered and returned it 64 yards to the Tampa Bay eight. On the third play of the second quarter, Thomas kicked a 19-yard field goal and the Bears opened up a 6-0 lead. 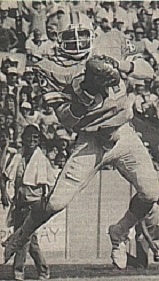 The margin increased when, on the third play of the ensuing series, Williams, again passing under heavy pressure, was intercepted by LB Otis Wilson, who ran it back 39 yards for a touchdown. Thomas added the extra point and the Bears, having taken advantage of turnovers by the Bucs, were up by 13-0. Tampa Bay responded with a drive of 59 yards in nine plays. Williams completed four passes, the longest to Kevin House for 21 yards in a third-and-five situation, and while the drive stalled at the Chicago nine, the Bucs finally got on the board when Bill Capece kicked a 27-yard field goal to make it a ten-point game. A short possession by the Bears resulted in a punt that DB John Holt returned 22 yards to the Chicago 31. From there, Williams scrambled for 12 yards and completed a play-action pass to HB James Owens for five yards. The series resulted in a 31-yard Capece field goal that narrowed the score further to 13-6. The Bears responded with an eight-play, 74-yard advance. McMahon completed passes to WR Brian Baschnagel for 13 yards and WR Rickey Watts for 31 to the Tampa Bay 19 at the two-minute warning. Three plays later, and facing third-and-ten, McMahon connected with Baschnagel for a 19-yard TD. Thomas added the point after and the visitors took a 20-6 lead into halftime. The teams exchanged punts to start the third quarter before a 17-yard return by Chicago DB Jeff Fisher had the Bears starting off at the Tampa Bay 45. McMahon completed a pass to WR Ken Margerum for 13 yards and Payton had a 10-yard carry before the drive bogged down and Thomas kicked another field goal, this time from 40 yards, to put Chicago ahead by 23-6. Now in a deep hole with less than seven minutes remaining in the period, the Bucs came back with a six-play, 60-yard possession. Williams completed three passes, the last to Jimmie Giles (pictured at left) for a 35-yard touchdown. Capece’s extra point once again narrowed the margin to ten points at 23-13. The Bears had the ball for the remainder of the period as their series was helped along when the Buccaneers were called for roughing-the-kicker on a punt. Ultimately, as the game headed into the fourth quarter, the visitors had to punt and the Bucs came through with a big play when Williams threw to House for a 43-yard gain to the Chicago 37. Another pass to House picked up 14 yards but the drive stalled at the 20 and Capece missed wide to the left on a 38-yard try for a field goal. On the next series, the Bears were backed up to their six and, on a third-and-24 play, McMahon quick-kicked 59 yards to the Tampa Bay 35. From there, the Bucs advanced 65 yards in seven plays. Williams completed another four passes, and missed a play due to a pulled hamstring after having to scramble. Once again facing major pressure, Williams threw to Giles for a 31-yard TD. Capece converted and the Chicago lead was cut to 23-20. The teams traded punts until the Buccaneers took possession at their 35 with 2:07 left in regulation. Williams threw to WR Gordon Jones for 14 yards on first down and followed up with a completion to House for 17. Another pass, to WR Gerald Carter, picked up seven yards and, following an incompletion, Williams scrambled for five yards in a third-and-three situation. The drive stalled at the Chicago 22, but Capece booted a 40-yard field goal into the wind with 26 seconds remaining on the clock to tie the score at 23-23. The Bears had one last shot and tried for a desperation 58-yard field goal by Thomas on the final play of regulation that fell well short. Chicago won the toss for the overtime period, went three-and-out, and punted. On Tampa Bay’s first play, James Wilder, who had carried the ball just once thus far, took a pitchout and ran 47 yards to the Bears’ 13 before being pulled down by CB Terry Schmidt. Two plays later, Capece booted a 33-yard field goal and the Buccaneers came away winners by a final score of 26-23. Tampa Bay dominated in total yards (424 to 248) and first downs (22 to 14) but hurt themselves with three turnovers, to one by the Bears, who also stifled the Bucs’ running game. While Tampa Bay ended up with 99 yards on the ground, 47 of that total came on the run by Wilder that set up the game-winning field goal. The Buccaneers also recorded four sacks, to three by Chicago. 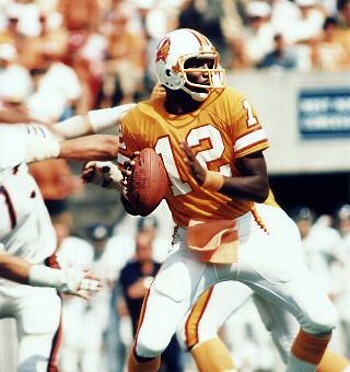 Doug Williams completed 25 of 49 passes for 367 yards and two touchdowns while giving up two interceptions. He also ran five times for 30 yards. James Wilder (pictured at right), with the one long carry, led the Bucs in rushing with 46 yards on two rushing attempts and also had 6 catches for 61 yards. Kevin House gained 95 yards on four receptions and Jimmie Giles contributed 75 yards and two TDs on his three catches. Bill Capece hit on four of five field goal attempts. For the Bears, Jim McMahon was successful on 12 of 30 throws for 167 yards and a TD with none intercepted. Walter Payton rushed for 109 yards on 26 attempts. Brian Baschnagel led the club’s receivers with four catches for 59 yards and a touchdown. “You can’t make excuses about it,” said Doug Williams regarding the turnovers that put Tampa Bay in a hole in the first half. “Give Chicago some credit…They forced us to make mistakes. The Buccaneers finished with a 5-4 record and were seeded seventh in the NFC. They were soundly defeated in the first playoff round by the Dallas Cowboys. It marked the last postseason appearance for Tampa Bay until 1997. Chicago ended up at 3-6 and twelfth in the conference. The Bears improved to 8-8 in 1983 and went to the postseason for the first of five straight years in ’84.